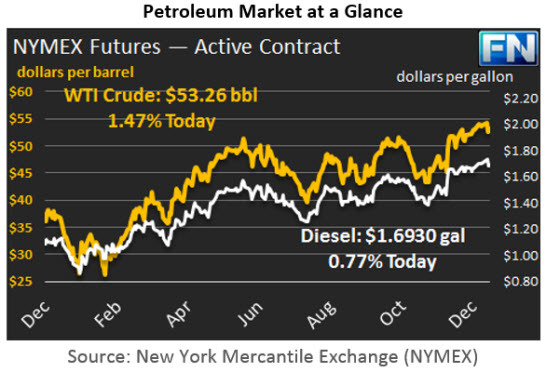 WTI prices strengthened yesterday, closing at $53.26/b. Today’s opening price was $53.39/b. 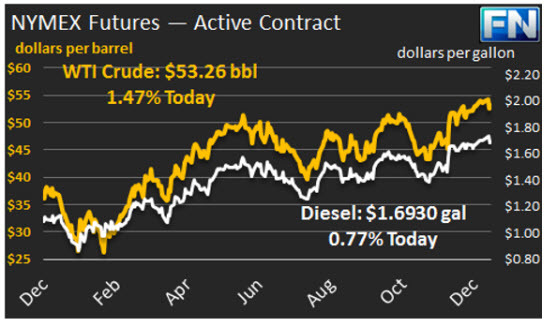 Prices have continued to strengthen, and are currently $53.66/b, $0.40 above yesterday’s close. Strength was lent to crude prices by a Bloomberg News survey showing that OPEC production fell by 310,000 bpd in December. However, the planned OPEC production cuts were responsible for only a fraction of this. Bloomberg reported that unplanned outages in Nigeria reduced output by 200,000 bpd. Nigeria is exempt from the production cuts, and its production had been rising in the fourth quarter. If Nigerian output remains constrained, and the rest of the OPEC countries meet their production cut pledges, this could be highly bullish for oil prices. Most forecasts had anticipated restoration and growth in Nigerian output. Markets are having a mixed reaction to oil inventory data releases. Schneider Electric’s survey showed a market expectation of a 2.8 mmbbls crude drawdown, a 1.2 mmbbls distillate stock build, and a 1.5 mmbbls gasoline stock build. The API reported a much larger swing in inventories: a 7.4 mmbbls crude stock draw, a 5.2 mmbbls distillate stock build, and a 4.3 mmbbls gasoline stock build. The Schneider survey shows a small net draw of 0.1 mmbbls. The API data, in contrast, shows a net stock build of 2.1 mmbbls. The official EIA data is scheduled for release today. Distillate prices rose around a penny yesterday to close at $1.693/gallon. Current prices are $1.6975/gallon, an increase of 0.45 cents, but the price trend appears to have a slight downward tilt in early trading. RBOB opening prices strengthened yesterday after declining in three consecutive sessions. RBOB closed at $1.6459/gallon yesterday, an increase of 1.37 cents for the day. Prices are currently $1.6403/gallon, 0.56 cents lower. Our second article today is the EIA’s summary of crude prices in 2016. The EIA notes that although prices rose above $50/b at the end of the year, average annual prices in 2016 were below 2015 average prices.